Sometimes good things just happen. Like when Damian Velasquez, an exquisite local furniture maker, walked into our showroom and during our conversation mentioned his friend David, who is making "these amazing lights". We get quite a few of these pointers or requests to take a look at someone's works and it is always interesting, often inspiring, but rarely as breathtaking as this. Knowing Damian as a guy with great taste I went to David's website - and almost hyperventilated! 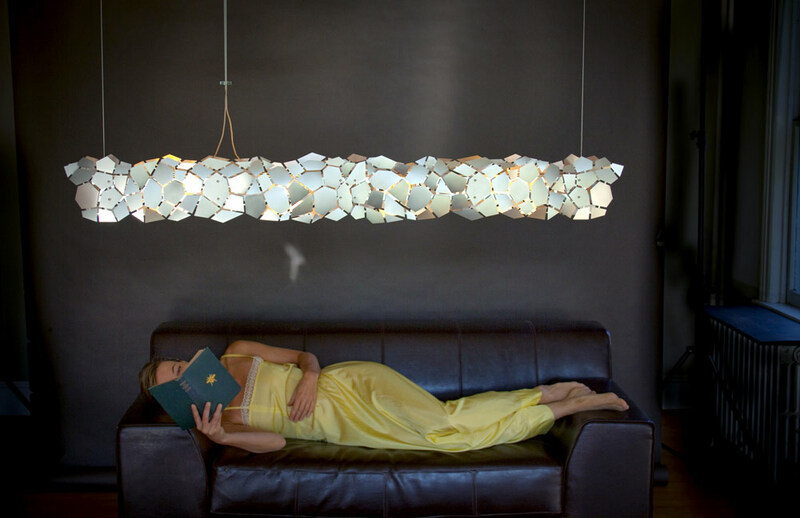 David D'Imperio is an award-winning artist who designs and builds sculptural lighting. He is an innovator in linear suspension lighting as an art form. For over two decades, D'Imperio has exhibited at many of the industry's most exclusive shows of American craft and design, including the International Contemporary Furniture Fair, the American Craft Museum in New York City as well as The Smithsonian show in Washington, D.C.
David D'Imperio's lighting brings a sculptural dimension to the spaces they occupy. His work lies in a place where the organic world meets the mechanical, where geometry and mathematical order meet the abstract. D'Imperio's pieces are noted for their inventive design, simplified without the clutter of interconnecting wires. His lights seem to defy gravity as they hang from thin cables. The Ozone, Beeline and Liquid suspension lights are his newest releases being offered in limited production. With the introduction of his newest series of linear LED lights, he has been able to push the boundaries of what can be created in this medium, both with respect to complexity of design and the structural limits of lighting systems. D'Imperio's work fuses new efficient technology with old-school handcraft and design methods. He approaches the initial design phase at a drafting table where his work is a study in imagination, precision and mathematical equations. To test the functionality and aesthetic, each piece is made into a 3-D maquette. The finished drawings are then digitized in order to facilitate an accurate fit for each component. The handcraft methods used to design and build each piece lie in stark contrast to the modern materials D'Imperio uses, such as ultra-light metals and color-balanced LED technology which provide a flood of light. For example, a six foot linear light illuminates a space with an output of over 2,800 lumens. D'Imperio's workshop houses no built inventory. Often working with architects and interior designers, every piece is made to order. Production is thereby, very limited.